We are a one stop custom printing and marketing solutions company. VR Custom Graphics, We can print it. We offer everything from signs, apparel, paper products, to just about any kind of promotional product you can think of. Need a fruit basket, custom printed golf ball, pens, USB drives etc we offer thousands of items. Design your shirt or sign at TshirtsSigns.com. Start a individual online store or fundraiser at fundthegoal.com Call us about paper products like business cards, invoices, etc at bargain prices or Internet products including SEO, hosting, and more. No more going to many different places to get everything you need. 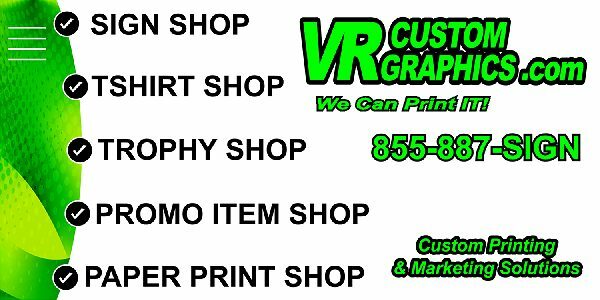 We are the one stop shop for all you custom printing and marketing needs. Whether your a business, individual, or organization the possibilities are only limited by your imagination.